Hey friends, my name is Riva from Riva La Diva and I’m sharing a fun pajama dress look for you today that you can make from the Blanc T Shirt pattern. As you probably saw on Tuesday, Melissa also shared a nightgown hack for this pattern, and here I have another one that’s slightly different. The Blanc pattern can be used for so many different basics and fun styles, and it was a perfect base for a nightgown. It came together in a flash one I altered the pattern (more on that below). But once it was complete, I was kind of a little scared of what it would look like on. What if it looked terrible? Luckily, it was THEN that I realize that the sewing Gods were with me (haha) because I couldn’t be more happy with the final look! There were some slight alterations that required 4 more sheets of paper to the master cutting plan, but all in all, it’s a snap to make and I think you will be happy with this as well! Lengthen the shirt pattern. This is so easy: Print out your pattern, line them up, but add a row of extra paper oin the lower half of the dress. As seen in the diagram below (in grey). Doing this will alter the side seam of your dress. 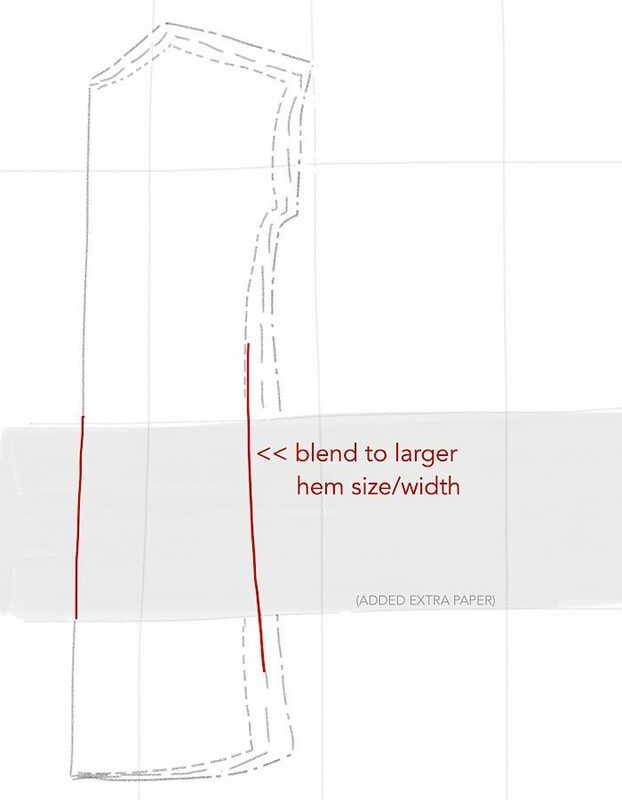 Because you want to add more width to in the hip area, do not be afraid to use another size to blend your hem into (as seen in the diagram above, in red). For example, I first used a size “medium” for the upper body. It’s a little looser than what I wear because I like it comfy. Next, I blended the hem to a larger hem width like the large or xlarge. Each width will be different and if you are already using the largest size, continue to extend your width and blend the hem. Then continue to follow the pattern instructions as specific in the direction.The pattern should be a breeze to sew. I would love to play with different variation of this dress for bedtimes. I loved using the almost sheer-like lace for today’s post and I’m betting my husband will, too! Thank you so much for visiting with me and have a glamorous day!